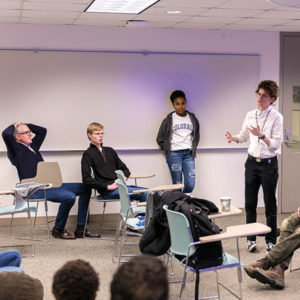 It’s 9 p.m. Friday, and John Garner ’20 (St. Paul) and five other students are huddled in an Olin-Rice classroom, launching into what’s shaping up to be a late night. By morning, they’ll have built a solution to a real-world problem—but morning is far away. 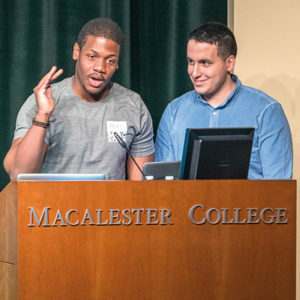 This is Macathon, the college’s popular overnight innovation and creativity contest that challenges students to put their educations into action and invent an original service or product—in less than 24 hours. The competition is modeled after traditional technology hackathons, but the spirit extends far beyond computer programming. Successful teams need a mix of technical, business, design, communication, and creativity skills. Those multifaceted conversations produce solutions that inspire the alumni judges, who return to campus from around the country to mentor students throughout the weekend. “Mac students are not afraid of tackling challenging problems,” says venture investor Seth Levine ’94, whose conversations with entrepreneur Per von Zelowitz ’94 sparked the inaugural Macathon. 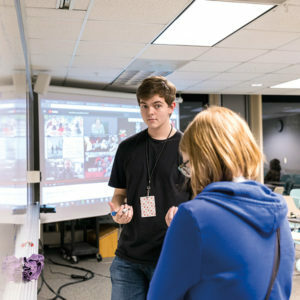 The competition has snowballed since then, growing from eight teams in 2013 to more than 100 students on 20 teams this year. Each year, the ideas these teams manage to produce by Saturday afternoon is impressive. But what does the path look like from start to finish? What roadblocks stall teams; which breakthroughs drive them forward? And when does anyone sleep? To find out, we recently watched Macathon unfold. Friday, 7 p.m. Macathon may be a competition with a $1,000 top prize, but Mac’s entrepreneur-in-residence Kate Ryan Reiling ’00 emphasizes its collaborative focus: “We encourage you to ask for help, from the judges and other teams.” Thirteen alumni judges start circulating in Olin-Rice to meet with each team in its designated home base, stopping in the hallways for casual consultations between meetings. They’re scheduled to be in the building until 10 p.m., but many are still there after midnight. 8 p.m. In the basement, Team Brudajocojula is seated around five laptops and water bottles. A whiteboard is jammed with ideas: climate farming, portable greenhouses, online clothes shopping, translating in doctors’ offices. 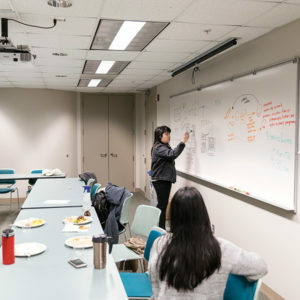 Because no advance preparation is allowed, this brainstorming scene is unfolding around the building as teams debate the directions their projects will take. Two floors up, Team Bigori Beauty Brush has homed in on its plan—and is already on the move. 8:25 p.m. In room 189, Team Datababes is combatting climate change by designing an app that rewards consumers for making sustainable purchases. They’re thinking about how to fund the app, musing whether ad content will generate the necessary revenue. “The judges always ask about investors,” one teammate notes. 8:40 p.m. 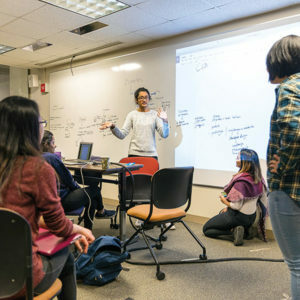 The Hacktivists—Jennifer Arnold ’19 (Waukegan, Ill.), Fouad El Hamdouni ’19 (Casablanca, Morocco), Min Hee Cho ’19 (Vernon Hills, Ill.), and Lilian Vo ’18 (Seattle)—are building a subscription box program to reuse toys. For the next few hours, they’ll review coding tutorials, build a toy-box prototype, and conduct market research. Like Team Sciuridae and many others, though, they’re first devoting time to another crucial topic: sleep. 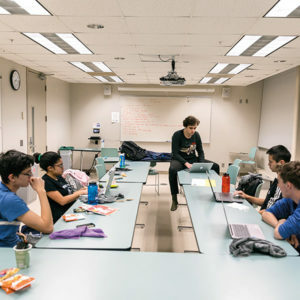 The best teams take breaks for rest, Reiling told the students, but what that means varies among—and even within—the groups. Arnold often finds fresh inspiration when she’s coding at 1 or 2 a.m. but needs short naps to power through; El Hamdouni warns his teammates that he rarely stays up past midnight. “Even with coffee, the energy is going to wane,” he cautions his friends. 9:55 p.m. “I’ve only had one cup of coffee so far,” Livvie Avrick ’19 (Wilmette, Ill.) says. Even though semifinals won’t be held until 1:15 p.m. on Saturday, Team Datababes is eager to start working on its final presentation. That’s a recurring theme around Olin- Rice right now: Everyone wants to start building the pitch—and articulating their solution—before fatigue sets in. “We’re all evaluating these ideas from different perspectives,” says John Garner ’20 of Team Sciuridae. Over in room 356, Team Jollof Rice is similarly flummoxed. The students know they want to improve health care quality, but they’re wading through wide-ranging conversations about internet access, health insurance, and the cloud. “I don’t know if this is a technology problem we need to be solving right now,” one teammate says, trying to steer the group back on track. With that, the teammates put on their jackets and go outside, breathing in the cold air, light snow falling around them. “Things are looking up for us,” says David Frye ’21 (Federal Way, Wash.). 10:35 p.m. 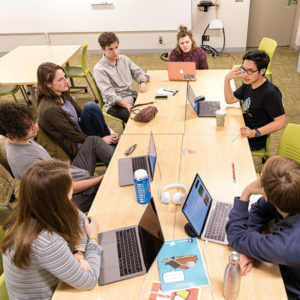 In Team Sciuridae’s room, the six students have determined their focus (a volunteer-matching database) and split up into pairs: two are at the whiteboard, outlining how their user interface will function, two are seated at laptops writing the presentation, and two are napping, sprawled across giant beanbags. Early in the competition, teams fill whiteboards with brainstorming sessions. Pictured: Team Hacktivists (clockwise from left: Fouad El Hamdouni ’19, Lilian Vo ’18, and Min Hee Cho ’19). Just before midnight, Jollof Rice reaches its own breakthrough. 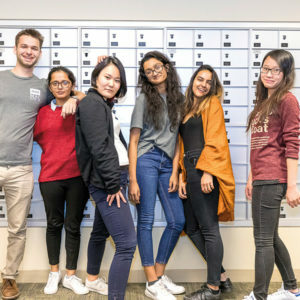 The four students wanted to focus on health-care records systems in low-income countries, but after an hour of talking in circles, they decide to target middle-income regions in developing countries with existing infrastructures. Judges pointed out, though, that this solution wasn’t breaking any new ground. “So we went in a new direction: incorporating community health program workers,” says Nana Adom Mills-Robertson ’18 (Accra, Ghana). “Instead of these workers just collecting data for the census, we want to collaborate with them to create a portable medical records system on a card. Then, instead of relying on paper records housed at one hospital, patients will have easy access to their complete medical histories, and the doctor doesn’t have to start from scratch during a diagnosis. 1:15 a.m. Teams are starting to divvy up the workload to make time for bursts of sleep. In Sciuridae’s room, Garner is working on his team’s website. Upbeat music—including a karaoke break—provides a boost. 1:43 a.m. Earlier in the night, the Datababes had planned to crash on Olin-Rice couches, but they’ve decided to head home instead to get a few hours of quality sleep in their own beds. 9:02 a.m. Cardboard scraps and tagboard—toy-box prototype remnants—are strewn across the Hacktivists’ workspace. Arnold is slouched over a laptop, squeezing in a nap. The other teammates are crowded around three laptops, half-eaten bagels strewn around. This early-morning crunch is focused on gearing up for the practice pitch session, a new Macathon component this year. You’d never know these sessions were optional—nearly every team signed up to get crucial input from judges before the afternoon’s semi-finals. 9:07 a.m. Team Sciuridae’s practice session is done, and they’re grappling with new questions raised by the feedback. Two judges stop by to see how things are going. Fritos are spilled across the floor, two students are sleeping on beanbags, and the room is lit by the projector’s blue glow. Team Sciuridae consults with judges. 4:30 p.m. All 20 teams gather in the John B. Davis Lecture Hall, while at the podium, Reiling holds a box containing the names of the six finalists. She announces the first team to advance: A Bug’s Life, six first-year students who created a gaming app to incentivize young consumers to support independent businesses. The team hurries to the stage, launching into their nine-minute presentation once more. The students field questions from the judges, and then it’s on to the remaining finalists, who outline projects focused on college access, diabetes, refugee migration, and the opioid crisis. Macathon champions: Team Bigori Beauty Brush. 7 p.m. After an hour of deliberation, the judges have decided. Jollof Rice takes third place ($500), with second place ($750) going to My Fantastic Roommates. Nana Adom Mills-Robertson ’18 (left) and Ayoub Belemlih ’18 of Team Jollof Rice present at finals.